There is some debate over how many different Scotch whisky areas there are in Scotland. Traditionally there were four – the Highlands, Lowlands, Islay and Campbeltown. However over half of all distilleries are in Speyside, and so that is generally regarded as a separate area, whilst for several years Campbeltown was not seen as separate owing to the closure of many of the distilleries there. 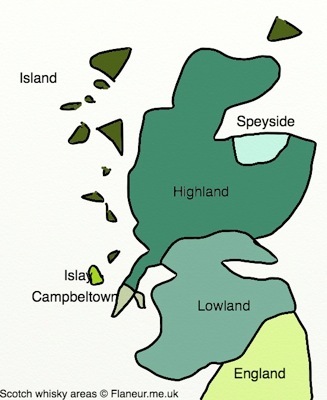 The Scotch Whisky Association sees the Island area as a subsection of the Highlands. Whiskies from each area have their own distinctive characteristics. Whilst individual whiskies will vary hugely, it is possible to give broad descriptions that characterise each area and give an idea of what to expect when you pick up a glass of their offerings. There are now only three Lowland distilleries – Bladnoch, Auchentoshan and Glenkinchie. These are often regarded as aperitif whiskies – being light, sweet with relatively short finishes. This is the biggest area, with a large difference in whiskies produced. They all tend to have a dry finish, but the taste varies, although all are less peaty than the Islay malts. Whiskies from Speyside are usually sweet and complex. Often regarded as the most complex of whiskies they can be rich and fruity, or light and fresher. The islands include Arran, Mull, Orkney, Skye and Jura. Usually a gentle peat flavour, but not on the same scale as Islay malts. Defined by smoke and peat, gained from both the water and the malting process. Was a major area for distilling in the past, although only three distilleries remain. Can be similar to the lesser-peated Islays, with a saltier finish. Of course there are huge variations between whiskies from the same areas and this can only be a guide to what to expect.